Hitchcock’s 1948 film Rope is best known for having been filmed in only ten extended takes. The Unraveling, a work designed for twelve monitors, reconsiders this cinema landmark by subjecting each of these ten shots to the slitscan technique. This method smears time across the horizontal axis of the screen: The right-hand side of the screen shows pixels almost a minute earlier than the left. The original film is already verging on the abstract: The central focus of Rope, more than the characters or plot, is the inescapable gaze of the camera as it transverses and explores the claustrophobic space of the single room in which the action takes place. 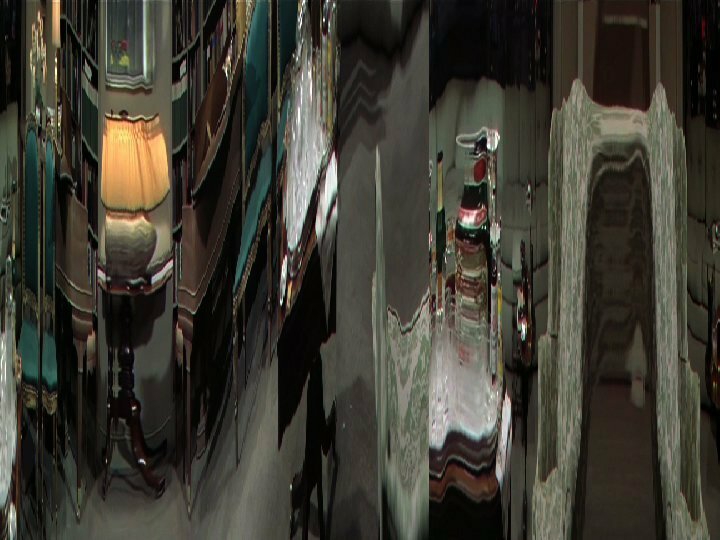 By spatializing the camera’s temporal movement, and showing each shot on a separate screen, The Unraveling proposes a new perspective on both the form and content of the original film. The small vocabulary of objects and characters, simultaneously appearing in different perspectives, provide a kind of Cubist simultaneity, revealing the tight drama of every visual element in the work, while the movement of the camera is transformed into a visual liquefaction of space and object. The relentlessly unfolding, unbroken time of the film becomes a landscape, a panorama of a single apartment in a single afternoon. Although the original film is not terribly concerned with telling a story – the unblinking gaze remains the star throughout – the characters, involved in an almost satanic charade of concealment, continuously appear, dissolve, and reform. The instability of their physical selves, and the monstrous transformations of their visages reflect the hidden agendas and constantly shifting relationships between the characters.